Like I mentioned in the previous post, my parents came down for a visit this past week. 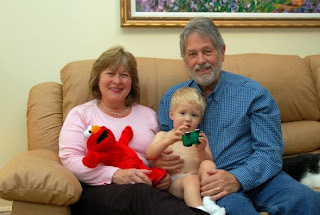 It was a quick trip, but still great for Dylan to get some quality time with his Grandmummy and Grandpapa. My dad had a dentist appointment down here in LA, so they came by afterwards for the night and following day. Those tender moments between grandchildren and their grandparents are so special and I'm thankful for the afternoon that we all could share. Our original plans included a walk over to the park, but it turned out to be a rainy day, so we all stayed inside. In the end, I think Dylan got to enjoy more one-on-one time with his grandparents and I'm glad for that. We hope to make a trip up north to visit them and my sister in the next couple months. 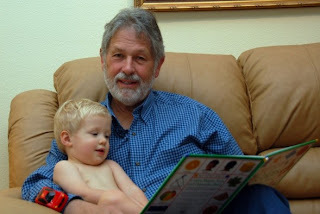 And since both my nephew Andrew's birthday and my birthdays are on the same day at the end of next month, we are planning to all meet up in Santa Barbara to all celebrate together. Oh, and today I spent a good part of the afternoon sorting through a random box filled with old letters, pictures, and drawings I had saved from long, long ago and forgot about until today when I decided that it needed to be opened. There were letters from my best friend at 11 years old, pictures from my 5th grade Catalina trip, letters and pictures from my high school boyfriends from 9th, 10th, and 11th grade... prom pictures, dance recital pictures, calculus notes, a 12 year old's new year's resolutions, swim team pictures, birthday cards, journal notebooks, and a few of my old horse drawings. Each picture and card surfaced a flood of memories, which I later shared with Ryan while Dylan napped and the sun set slowly outside. It was an afternoon for reminiscence and reflecting on what shaped me into the person I am today. Those pictures are adorable - looks like a great time was had by all.